We’ve talked about the ethics of professional editing, and about why you shouldn’t buy content online. But in the real world, gray areas and special cases never seem to go away, and ghostwriting is a great example. So how is this different from plagiarism or buying from a content mill? Ghostwriting is acceptable when it comes to producing blog or website content or certain types of books. The ethics of ghostwriting come down to intent, and to the concept of outsourcing. Many business professionals are experts in their field, but they’re not expert writers. They’ve heard about this “content marketing thing” that involves having lots of high-quality regular blog posts to boost their business, but they’re not sure how to go about creating those posts when they have an actual business to run. After all, it’s hard to think up, write, and edit four blog posts a week when you’re also trying to do the bookkeeping for six companies, build and market widgets, or design the next great iPhone app. Or maybe they have an amazing idea for a book to share their life story or lessons learned from business, but they just don’t have the time or skill to actually put that story down on the page. In many cases, people who hire ghostwriters have tried to do the work themselves first and realized that it just doesn’t make sense to keep on struggling. They can’t get the story to come out like it sounds in their head, or they’re losing billable hours to staring at a keyboard in frustration. In these cases, hiring a ghostwriter is a perfectly reasonable form of outsourcing. You’d hire a professional to do your taxes instead of muddling through it yourself and coming out with something that kind of, barely, looks like a tax return, right? So why not hire a professional writer to handle your blog or book? When you’re a busy professional and you’re looking for some help in the content production department, ghostwriting just makes sense. 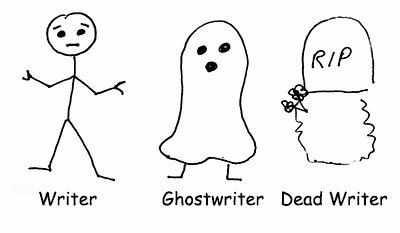 Ghostwriting is significantly different from editing, though. When you hire a professional editor, that person tunes up what you’ve already written, helping clarify your meaning, streamline your thoughts, and generally make your work the best it can be. Often, they’ll give you helpful tips and tricks along the way to improve your writing from the get-go, lessening the need for major edits next time. When you hire a ghostwriter, you’re not giving them anything to work from but what’s in your head. A ghostwriter will sit down with you to start to understand the goal you’re trying to achieve with your writing; you’ll go through several interviews as they get a feel for your personality, aims, and conversational style. Then they’ll start writing. A great ghostwriter vanishes from the piece—they’re a professional chameleon, able to take on the voice and tone of their client. In one project, they might sound extremely academic; in the next, they’ll be chatty and casual. It’s all about channeling the client onto the page. From interview to first draft to revision to publication, the ghostwriter handles the entire writing process for you (often even working with an editor themselves to polish up what they’ve created). All you have to do is explain what you’re looking to achieve, be interviewed a few times, tell some relevant stories, review the drafts and make suggestions, and look forward to the final book or blog post! So the short version is: an editor polishes something you’ve already written. A ghostwriter creates something for you, using your expertise as the source material.